New app that enables sharing of array suspension information and inventory data joins updated Performance Manager 2.4 and Line Array Calculator 3. Harman Professional Solutions announces the new JBL Array Link app for iOS and Android, plus key updates to the Performance Manager and Line Array Calculator software applications. 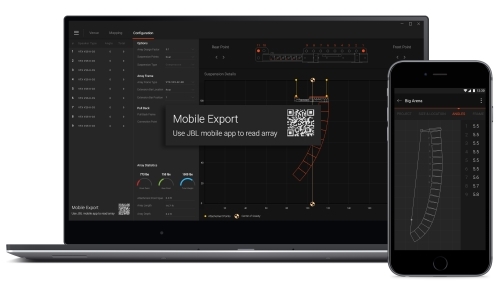 Designed from the ground up, JBL Array Link is an innovative app that enables systems engineers to quickly share array suspension information and inventory data, streamline the deployment process, and save valuable time and expense. Along with the official launch of the new JBL VTX A12 line array loudspeakers, these new software tools underscore Harman’s ongoing commitment to meeting the needs of modern live sound professionals. The JBL Array Link app can receive array information in a number of ways, including reading a QR code generated by Line Array Calculator 3 using the camera on an Android or iOS mobile device. The Array Link app automatically scans the code and uploads the LAC3 data, which is then displayed in an intuitive fashion across the different pages of the Array Link app. This enables users to quickly see at a glance what their array size, weight, and inter-enclosure angles are. Additionally, file information saved on the user’s phone can be shared instantly with other Array Link users via QR code or text message. JBL Performance Manager 2.4 builds off the progress of Performance Manager 2.3, which included updated VTX presets and multi-touch support, and offers complete support for VTX A12. — New Array Size Compensation Filter—this new filter is designed to help front of house engineers and systems technicians better manage the LF response of VTX systems, and tailor the array starting point to better meet their needs. Additionally, the single-parameter adjustment aspect of this filter set gives systems engineers a streamlined path towards proper system balance. — New Virtual Venue Alignment Assist—this new tool helps to align and organize virtual systems, enabling users to more quickly build a visual representation of their system for effective monitoring and control. In offline mode, new guidelines automatically appear and help align and organize arrays and amp racks in the venue file. Coupled with more complete support for touch-enabled devices, this new alignment assistance will further speed the process of system design and deployment. Featuring a completely redesigned, more intuitive UI and a fully resizable, zoom-enabled display window, JBL Line Array Calculator 3 delivers precise acoustic predictions for the response of VTX systems and offers updated mechanical reports for physical array predictions. The venue prediction window now offers an unlimited number of planes additional virtual measurement probes, as well as enhanced prediction tools to support frequency response averaging of multiple virtual measurements. Another key update for Line Array Calculator 3 is the addition of a new subwoofer prediction mode. Users can enter multiple subwoofer clusters into the display window and predict the broadband polar response of the entire array, with variable adjustments for container spacing, size, and arc opening angle if the user wants to calculate delay times for arc-delaying a single or spaced array. The response of the entire subwoofer array can be predicted via a broadband frequency average, or by looking at the polar response of the array at specific frequencies. This enables system designers to make more informed decisions about how subwoofer arrays should be placed in venues, and aids in optimizing the arrays for peak performance. The JBL Array Link app, Performance Manager 2.4 and Line Array Calculator 3 are expected to be available in the Spring of 2017.